Goodreads: A sensitive orphan, Jane Steele suffers first at the hands of her spiteful aunt and predatory cousin, then at a grim school where she fights for her very life until escaping to London, leaving the corpses of her tormentors behind her. After years of hiding from the law while penning macabre “last confessions” of the recently hanged, Jane thrills at discovering an advertisement. Her aunt has died and her childhood home has a new master: Mr. Charles Thornfield, who seeks a governess. Kritters Thoughts: As Jane Eyre week continues, this was the first book I thought of when I knew I was going to do this week. I went to the signing for this book a bit ago and it has sat on my shelf because even though the author said I could read without reading Jane Eyre I knew I would want to do Jane Eyre first before reading this one. Overall this book was a great adaptation of the book and I loved how it was formatted exactly like Jane Eyre. With three volumes that divide up the story, it was fun to read a story in that format again. 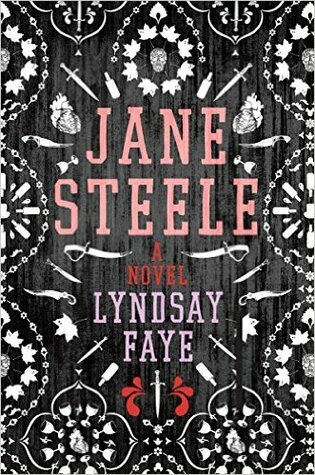 I absolutely loved that Jane Steele clearly referenced and referred to the original work Jane Eyre, she was obvious in the way that she spoke about Jane Eyre and I liked the transparency. I liked this adaptation. I loved giving Jane the "ability" to kill those who wrong her that was fun to read! I would say I think you should read or have read Jane Eyre first because there are so many references and extra things you will pick up if you have read that previous to this one.